The production of the Hokuto no Ken movie just astounds me. 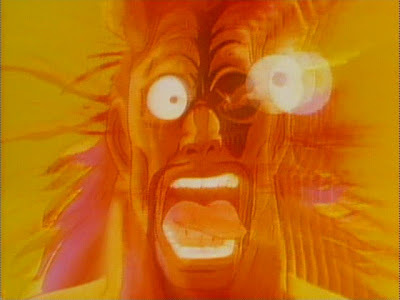 The above screencap is an accurately IVTC'd shot from the R1 Fist of the North Star DVD. The R1 is clearly a telecine from a different print than the Japanese LD, which can be proven by the film generated credits at the end of the film, and the fact that the Japanese telecine has frame blending on all the footage while the R1 does not. No, I don't feel like screencapping them both. You can trust me on this one. What we have above is clearly a video edit, between the lack of resolution and the bizarre deinterlacing in the hair that blends separate film frames. The censorship is identical on the Korean R3, which is taken from the same telecine as the Japanese VHS/LD releases from 20 years ago. In other words, both the R1 and R3 telecine, though taken from different prints, both have video editing. The film was edited on video and printed to the film master before the video telecine, and all subsequent film prints (ie: all one of them for Streamline) have been released have been from that new, haphazardly edited film master. Which makes zero sense when you realize that Streamline was intentionally seeking out unedited, controversial Japanese animation. Remember that comparison of Shin turning Ken into swiss cheese last time? Remember how the film clip shows the finger moving out of frame and the LD didn't? That wasn't my doing. There's at LEAST 6 frames missing from that 35mm print, so all the rumors of the original theatrical edits being uncensored seem to be genuine. For having said "hell no", what with the edits being done on film, I apologize to the world. Simply put, Toei is friggin' insane for having edited the film this way, and I could not wrap my brain around why anyone in the world would have telecined the film, edited it on video, and then printed the video frames back to film and splice them into the IP. It's nuts. Absurd. Daft. Looney. Crazy, I tells ya! With any luck the "new" R2 DVD will be a brand new 35mm print from the uncensored camera negative, or even a scan of the actual OCN (Original Camera Negative). If it isn't, that means we're literally seeing a new transfer of a 22 year old 35mm IP (Interpositive Print), complete with 22 year old scratches, hairs, dirt and punches in the film to show where the film is split onto different reels. I'd say that using the first old print lying around is inconcievable, but that's exactly what Geneon did on their botched Perfect Blue HD Remaster, and in the case of Macross: Do You Remember Love? Bandai was very careful to note it was taken from the "Original Positive Print" - likely a 16mm blow-up, but I digress. If Toei releases a censored version of this most holy of holies, I'm going to be very upset, but seeing as how the English dub is included as a first-press bonus I can't not pre-order this one. Please, Toei. Don't screw this one up.